So need to get this off my chest folks. For 17+ years I have been married. It has not been a good marriage. I will not bash my husband even though sometimes it would feel better to do so. But I will tell you he is an alcoholic and has always been very verbally abusive. Just recently he threatened to hit me and that is the reason I have finally left him. I really feel he threatened me to get me out of his life for good. And so it is. My life is in upheavel not having my crafts and supplies here at my moms. All my craft stuff is at my old house so making dollys is out of the question for now and that is killing me. If I'm not creating then I'm going mad! So today I go to pick up some things such as my sewing machine, fabrics, sewing supplies and some of my patterns to work on. Or I will loose my mind. I have stacks of things to do, stuff to pack and phone calls to make and all I really want to do it craft. I need it for sanity sake. So off I go to my old house. This is not the first time he has threatened me. It is one of the several. I have been thinking of leaving him for a long time anyway. He was worned back in March, but he didn't do anything about trying to make our lives better. The worst thing is how he treats his daughter. It is horrible to say the least. For a child to say she would rather walk down the isle alone instead of having her father walk her, that should tell you something. So sorry that I am dumping like this but if I don't I will go mad. Thanks for listening and thanks for being there my friends. I don't feel so alone when I hear from you all. I hope in the future I will have positive things to write about but as for now, I'm gloomy and broken hearted. There are several things that are good. The first one is that I will be going to beauty school in just a couple of weeks. I need something to help feed my family and working at Walmart just won't pay the rent. Also, I have my mom's to stay at for the duration but the adjustment is still taking some time to get used to. We all are working together for that. You are cordially invited to visit my new "Snugglebug Selling Blog." Just click on the Title in the upper right hand corner of this blog where it says "Snugglebugs Selling Blog or type: www.snugglebugssellingblog.blogspot.com. There, you will find whimsical dolls and cans, vintage inspired jewelry, mixed media and more. I have been following "Somerset Studio" magazine for several years now and have fallen in love with mixed media. It has been refreshing to work with different types of mixed media and love the ability to just let go. So I invite you to visit this new blog and see some of the offerings I have there. If you like a little bit of the different and unusual, then you will like what you see there. Some of the new items to be added will be: vintage bags for carrying all those wonderful goodies and books, sachets, potpourri, dollies and more. Thanks for stopping by there and if you have a moment, please drop me a comment. God bless all! PS. Folks I am sorry for not being able to respond to your wonderful comments lately. My computer is giving me a fit. But I do appreciate each and every comment and plan on taking this old jalopy of a computer back to the computer doctor. Thanks again, and please be patient. 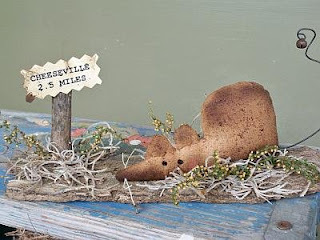 A Frog, a Wish and a Place Called Cheeseville? Meet Miss Fairy Mouse. She grants wishes. Lots of wishes as long as they are nice ones. This little gal can be found at my "Arts a Flutter" page and is just $26.00 ppd. (Snugglebug Blessings Original) Miss Fairy Mouse is SOLD! Thanks so much. 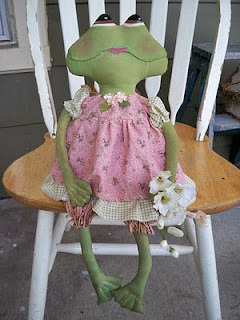 So what is green with big lips, webbed feet and wearing a pink dress??? Strange discription for a frog, but yep, that's what she is and she is so very adorable. (Sweet Meadows Farms pattern) She is found at my "Humble Arts" page and is selling for a mere $42.00 + $4. s/h. You can e-mail me for purchase from this blog. Thanks so much. 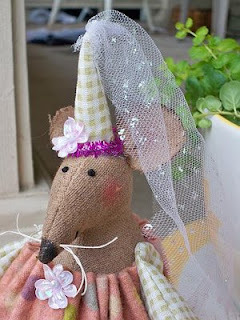 This sweet mouse is found a my Lemon Poppy Seeds site but has been SOLD! (Kentucky Primitive pattern) Thank you so much. Hope you enjoyed my July offerings.! God bless and have a wonderful, creative day!